Rural Maricopa is home to several archaeological sites that contain petroglyphs along local mountain passes. Aaron Wright, preservation archaeologist with Archaeology Southwest, said the ancient Hohokam-style rock art was created by Native Americans between 800 and 1,300 years ago. Their function? 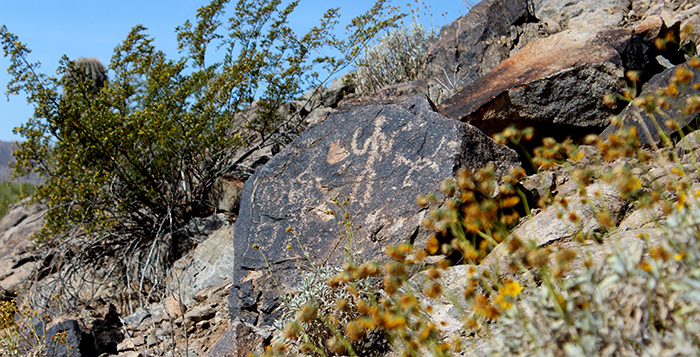 Wright said the petroglyphs, which adorn desert boulders, served as shrines. Nearby mountain passes once provided a migratory trail for people traveling between two large villages that used to exist on either side, Wright said. Ancient travelers connected with their environment by etching the stone with symbols. “Surviving in the desert and going long distances was important to them and one way the connected and obtained meaning from that was by creating and visiting shrines as they travelled,” Wright said. Although the shrines still exist, modern roads and a lack of preservation have provided uninhibited human access to the petroglyphs, resulting in one site being vandalized with graffiti and litter, and another succumbing to theft and destruction of the rock art. The precise locations of petroglyph sites have not been disclosed in light of previous vandalism and because most local sites are located on private property.